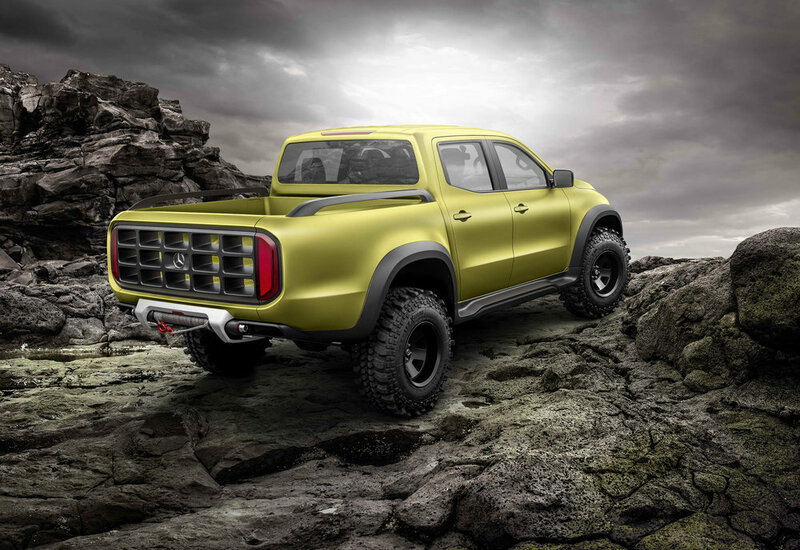 Mercedes-Benz Vans has shown a new Concept X-CLASS - described as a ‘concrete outlook’ to a future pick-up model. 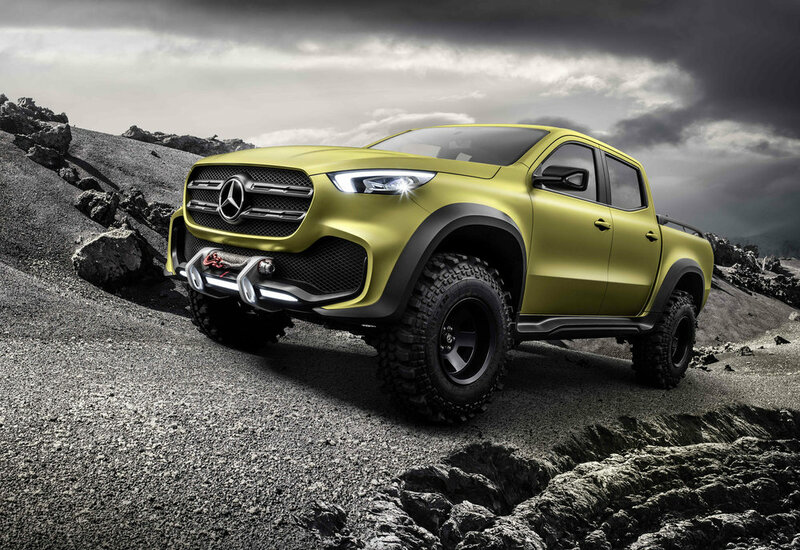 The first premium pick-up from Mercedes will combine the 'best of two worlds' - which is demonstrated by two design variants of the concept X-CLASS. 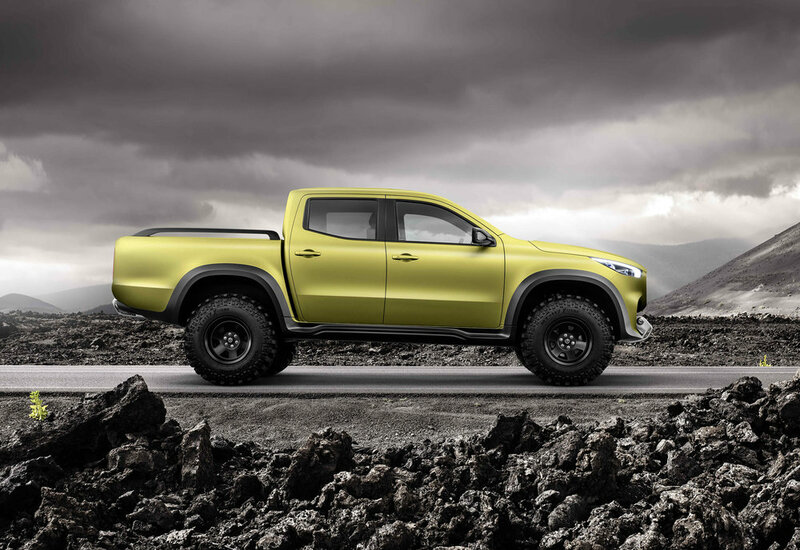 The Concept X-CLASS ‘powerful adventurer’ illustrates that the future X-Class will possess all the strengths of a classic pickup – tough, functional, strong, and with off-road capability. The Concept X-CLASS 'stylish explorer' goes a step further and shows what will distinguish the pick-up bearing the Mercedes star. 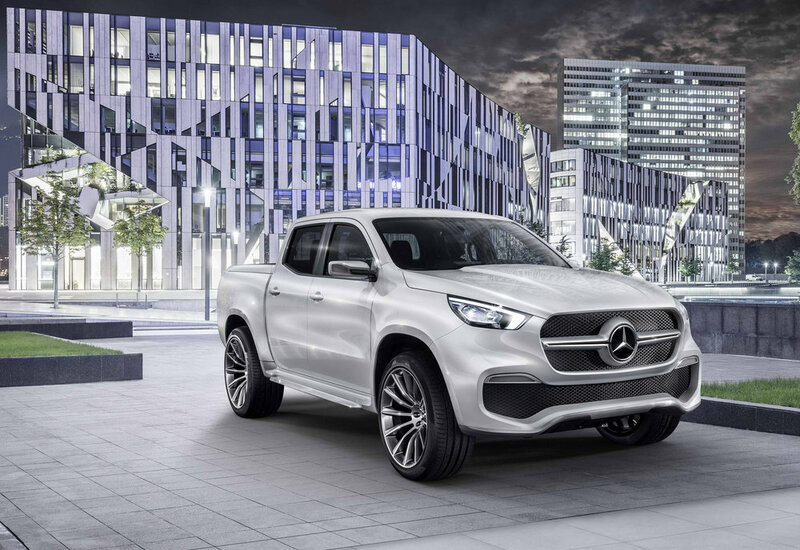 The future X-Class will come with hallmark Mercedes brand design and comfort features, as well as the German brand's driving dynamics and safety. Mercedes says this will make it the first premium manufacturer to account for the 'changing customer requirements' in the global segment of mid-size pickups. The new model will be a tough one-ton pick-up with seating for up to five people, and one that aims to to be attractive as an urban lifestyle and family vehicle. With the pick-up, Mercedes-Benz Vans will expand its product range with a fourth model series. Daimler AG will investments in the high nine figures (euro) in the new model series by the time of the market launch. It will be launched in late 2017 under the name Mercedes-Benz X-Class. The key markets will be Argentina, Brazil, South Africa, Australia, and Europe. Dr Dieter Zetsche, Chairman of the Board of Daimler AG and Head of Mercedes-Benz Cars: "With the Mercedes-Benz pickup, we will close one of the last gaps in our portfolio. Our target: we want to offer customers vehicles matching their specific needs. The X-Class will set new standards in a growing segment." "We will open up and change the segment of mid-size pickups – with the world's first true premium pickup for the modern urban lifestyle", says Volker Mornhinweg, Head of Mercedes-Benz Vans. 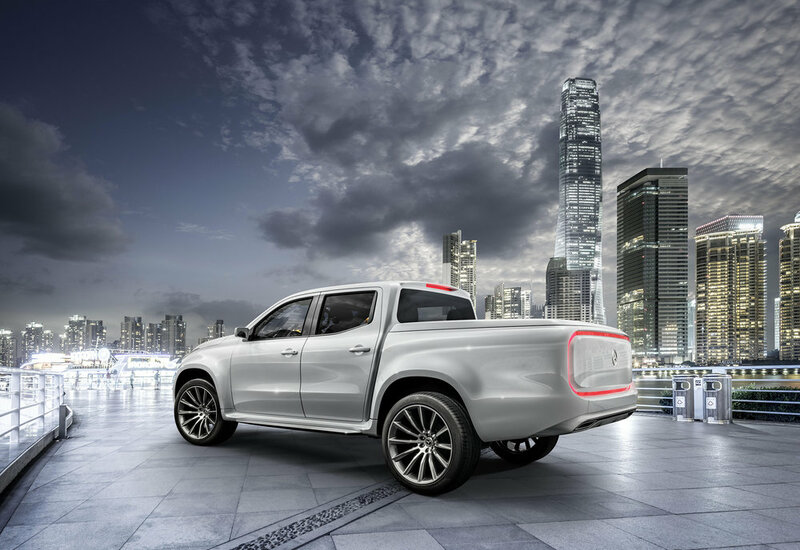 "Our future X-Class will be a pickup that knows no compromise. Ladder-type frame, high-torque six-cylinder engine, and permanent all-wheel drive are compulsory for us. As an added value we bring safety, comfort, agility, and expressive design – in other words, everything that distinguishes vehicles bearing the Mercedes star. We will thus appeal to new customers who have not considered owning a pickup before." The top-of-the-range model will be powered by a V6 diesel in combination with 4MATIC permanent all-wheel drive, for 'high driving dynamics' on the road and off the road. The all-wheel-drive system will combine an electronic traction system, a transfer case with reduction gear, and two differential locks. The traction system and the electrically operated on-demand differential locks channel the power to where traction is best. Under extreme off-road conditions, the rear differential and the inter-axle differential can be locked. This will make it possible to safely master difficult obstacles and inclines. The X-Class will have a 1.1 ton payload and a towing capacity of up to 3.5 tons possible. Enough power for transporting four cubic metres of firewood on the pickup bed and a sail boat hooked up to the trailer coupling, for example. At the same time, the specially constructed suspension with wide axles, a five-link rear axle with coil springs, and a precisely calibrated spring/damper set-up will ensure a high ride comfort – on the road and off the road, says Mercedes. Precise steering, a comfortable ride, and agile cornering is also said to feature, and It will absorb bumps in a 'superior fashion, making it a perfect fit for the urban environment'.